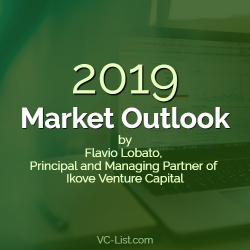 Flavio Lobato is Principal and Co-Founder of Ikove Capital Partners. Previously, he was an Executive Director at Liongate Capital Management, a $7 billion alternative investment manager based in London and New York. He was also a founder and CIO of Swiss Capital Asset Management in Lugano, managing over $1.5 billion in hedge fund investments for institutional clients. Prior to that, he was a VP at Goldman Sachs & Co. and a Director at Credit Suisse First Boston. He is a student advisor to the Harvard Innovation Lab (I-Lab) and Co-Head of Fintech for Harvard Angels of NYC. Commenting on short-term market movements is usually a futile task. One should focus on longer-term macro trends. 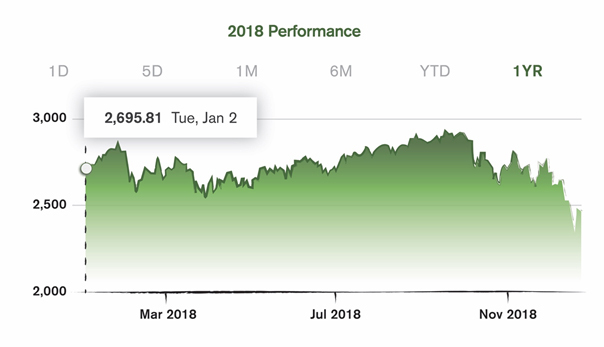 Since 2018 was the first significant yearly stock market loss since the Financial Crisis in 2008, and December 2018 was the worst December stock market performance since the Great Depression of 1929, I felt compelled to comment on current market gyrations and provide an outlook for 2019 and beyond. To put this into a larger perspective, the S&P 500 had been going straight up since bottoming in March 2009. 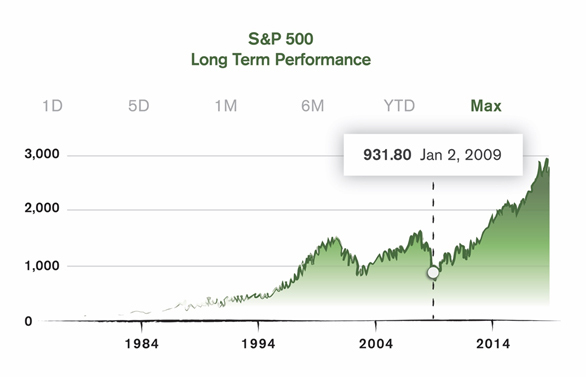 There has been 10 years of gains and close to 180 percent return, with very little downside volatility. Clearly, the market needed a breather. The gains were greatly supported by the Federal Reserve’s zero interest rate policy (ZIRP) and quantitative easing (QE), which were put in place to supply money and liquidity to the financial markets and avert another crisis. There is much debate about whether the Fed and other central banks kept monetary policy too loose for much longer than needed, creating an overextended position in riskier asset classes. During 2018, the Fed raised interest rates four times and began to shrink its balance sheet. As a result, the fuel that the stock market enjoyed from QE and easy monetary policy was no longer a tailwind, but a headwind. Individual company fundamentals will be increasingly more important than perhaps at any other time in the past 10 years as the Fed normalizes monetary policy. As a result, volatility is rising again. By historical measures, volatility has been unusually low for many years due to extremely accommodative monetary policies. 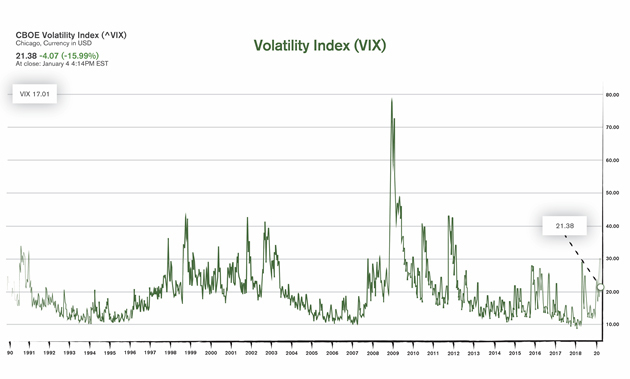 However, as the chart below shows, recently higher volatility levels are not extreme by historical standards— if anything, the “extreme” was the low-volatility period we had been experiencing in recent years. What is causing this renewed bout of volatility? Normalization of Monetary Policy – As the Fed normalizes interest rates and overall monetary policy, it will continue to add fuel to the volatility fire. Usually the early cycle of rate hikes is positive for the market, as it shows confidence that the overall economy is strengthening. However, as rates continue to rise, they eventually become a headwind to stock prices because higher rates means lower present value of discounted cash flows, which negatively impacts stock prices. Uncertain policies coming from Washington – From trade wars to border disputes, the market is spooked by the unpredictable behavior coming from Washington. The political uncertainty has definitely been a contributing factor to overall market volatility. Trade policy uncertainty is now starting to negatively impact corporate earnings and business outlooks despite the tailwinds from tax cuts. The market hates uncertainty and short-term volatility will continue to be elevated so long as these issues remain unresolved. Paradox of Growth – We could very well experience a tug-of-war between a volatile stock market and an economy that continues to experience strong growth. As the economic slack created by the Financial Crisis continues to be filled and as the economy reaches full employment, the potential risk of wage inflation increases. Unlike other periods in history, inflation has remained subdued due to continued strong productivity growth, the exportation of cheaper labor abroad, technology advancements and efficiency gains. The Fed has a dual role of maintaining full employment and controlling inflation and is just now getting back to a more neutral monetary policy after years of QE. All of these factors lead to higher economic and market uncertainty and increased volatility. Our outlook for 2019 is positive for the economy. Consumers and businesses remain buoyant and over time, the markets will grow in line with overall economic activity. A lot of the recent volatility is due to lower growth concerns, but so far, we have not seen evidence of this in the U.S. economic data, which remains robust. China has been slowing for quite some time, but at some point in 2019 we could see their government try to stimulate their economy once again. We are negative on bonds, as we expect long-term interest rates to resume an upward trend like we saw earlier in 2018. As rates continue to rise, the headwinds for bond investors will be significant. We have an entire generation of bond investors that have never had to deal with a bear market in bonds. This would be particularly difficult for prices of longer-duration bonds, and especially bond mutual funds and bond ETFs, which do not have maturity dates that provide some clarity on the return of capital to their investors. Shorter-duration and hedged fixed-income strategies will make a lot more sense in a rising rate environment since parts of the yield curve could remain flat or inverted for some time if the Fed continues to raise short-term interest rates. The good news is that the plumbing of the economy is working well, with few signs of the excesses or irresponsible lending that occurred before the Financial Crisis. As we have seen, debt market crises are much harder to successfully resolve compared to bear markets in stocks. In short, we see the current bout of stock market volatility as primarily an adjustment to a normalization of monetary policy, which is a result of a new phase of economic growth; and secondarily, a reaction to a number of other short-term political uncertainties that are likely to be clarified in the coming months. With the normalization of monetary policy, we are effectively removing the “training wheels” the Fed put in place during the Financial Crisis. Honestly, it is a welcomed sign. This type of environment is quite positive for illiquid asset classes, as managers tend to have a longer-term view and are sheltered from day-to-day movements. I do worry about some large IPOs (particularly in the tech space) that are scheduled to come to market. If volatility persists, we could see delays in some key offerings. As extreme volatility quiets down and the markets return to normal, underlying fundamentals will dictate performance again — welcomed news indeed. Additionally, we remain quite positive on venture development, as demand for early-stage funding continues at an all-time high and the opportunity to identify disruptive technologies within research institutions is an untapped opportunity. Future performance will require skill rather than indexing. Stock/company/technology selection will matter again. Underlying fundamentals will rule again. 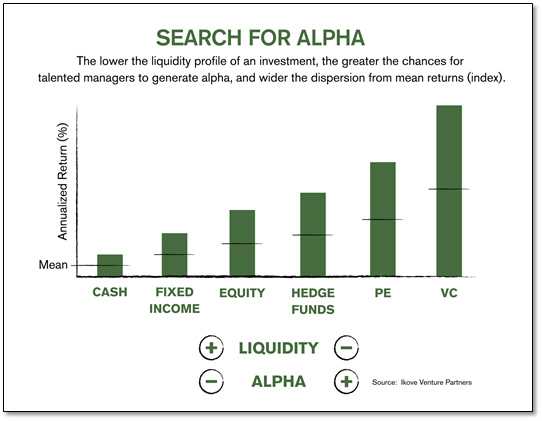 Alpha generation will be back in the vocabulary of investors. If you found the late-90’s Dot Com bubble confusing, buckle up for the current state of the VC market. The venture capital industry has undergone rapid changes in the past five years, and many are left wondering what’s next as investors are more selective than ever. In 2017, there was $84.2 billion in deal value (the most since the Dot Com era), which was allocated to a total of 8,076 deals across the board. While deal value was up, deal volume actually decreased. Less than one percent of the deals took up 23 percent of the total VC investments and more than 50 percent of those deals consisted of $50 million or more. Additionally, in 2017, only 769 exits were completed, lowest number since 2011. However, exits are increasing, with 2017 hitting highest median exit amount in a decade and highest year-over-year increase ever. There is a direct correlation between the drop in exits and the rise in mega-round funding, meaning companies are staying private longer — and need the necessary funding to make it to a liquidity event. This shift poses a challenge for VCs. They now have to continue funding business well beyond their optimal return curve so companies can continue operation, which is stressing the term limits of their funds. With the focus shifting to more developed deals, what does the future look like for early-stage startups and investments? Before we look into our crystal ball, let’s review how early-stage companies gain capital from the traditional venture model. Stage 1: At this stage, founders invest their own funds into ensuring their passion project comes to life. They’re using the funds to build out their proof of concept and a business plan. Stage 2: After building out the pilot product, as well as a roadmap to what growth looks like for their company, founders seek out friends, family, and as a great investor once mentioned, fools for their next round of capital. Typically, at this stage entrepreneurs need to continue testing the idea and hone in on the specific problems the product solves. Stage 4: The next source of available capital for early-stage companies are angel investors. Typically, angels provide the bulk of early-stage funding for startup companies, and networks of these investors can be found throughout the U.S., Asia and Europe. On average, angels allocate around $25-$50k per deal and the networks themselves invest around $250k per deal. In order for a founder to raise more than $250k, they would need to syndicate across multiple angel networks. Angels and angel networks do more than provide startups with access to a variety of investors. They also serve as a resource for the investors, giving angels a platform to source deals, get support on due diligence, mentor early-stage companies and provide capital. There’s a new class of investors that early-stage founders can research called super angels. Super angels (also known as micro-VCs) invest in startups, write bigger checks and have a robust network of relationships that can help cover the $1 million threshold of a seed round. In some cases, the lead super angel continues to support the company as it hits major milestones and needs further capital. 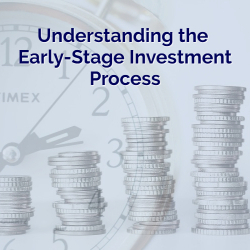 The early-stage investment dynamic has seen its fair share of transformation over the years, but understanding how traditionally early-stage companies seek capital will help us understand the challenges they’re facing in the current market. Increased inflow of capital into a market is typically a good thing. Too much money, however, is a problem. Given this dynamic, it’s fair to expect that when more money is invested into VCs, the size of checks they’ll write will also grow, causing the funds to move upmarket. At this point, there is greater capacity to absorb the influx of capital. In theory, if capital increases and the number of deals increases, the market will continue to grow and valuations will rise over time based on company fundamentals. Unfortunately, the number of deals is actually shrinking. This, combined with a growing deal value, means investors will primarily focus their investments into one arena: late-stage deals. For an early-stage company to even be considered for allocation in this current state, they need to prove growth metrics and their viability of churning high valuations. This is making it nearly impossible for early-stage companies to break through the threshold of stage 3 in the traditional investment process. With angels limited ability to fund beyond seed rounds, early-stage companies, entrepreneurs and founders lack the necessary resources to make it through the “Valley of Death.” Without adequate funding, companies are unable to fund growth, commercialize and hire the right talent. 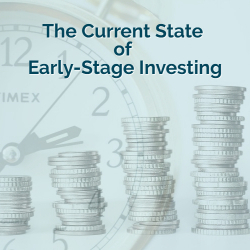 While early stage investing is facing uncertainty, that doesn’t mean investors should write off all early-stage investments entirely. 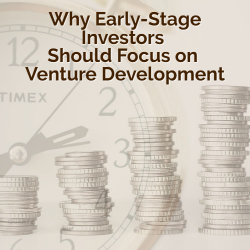 Rather, investors should focus on “venture development” investments. 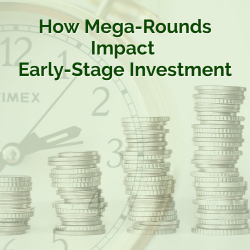 Venture development is a model that focuses on early-stage companies that have smaller funding needs and a high chance of significant returns without the need for large rounds. Leverage Existing Research: This tactic seeks out companies and technologies that have been vetted by leading research institutions and are reinforced with significant R&D investments. Since the technologies from these early-stage organizations are developed through universities, shareholders can expect less dilution as operating the business costs less. To find organizations that are heavily supported, investors should leverage the vetting process of a Startup Nursery. Heavy Involvement: According to the Kaufman Foundation, strong due diligence and heavy involvement are key determinants of future returns. The venture development model is set for success if investors are heavily involved in the launch and operations of the business. Becoming personally invested will ensure that the business will succeed as there will be more at stake. Additionally, the model permits investors to achieve founder level equity — which is rare in traditional VC. A Look Beyond the Coasts: Investors are just beginning to penetrate the innovation that is being harbored in the Midwest, and there is untapped potential waiting to disrupt markets. The Midwest – the largest economic region – takes 25% of total US R&D investments, but less than 4% of venture capital investments are allocated to the region. In comparison, California in attracts 55% of VC investments. With breakthrough technology, access to world-class talent and other resources at the fraction of the costs of the coasts, Midwest early-stage businesses are positioned to grow with less funding. This means high ROI for investors. Build to Exit: Given the current exit dynamics, the venture development model poises early-stage companies to become acquisition targets. Keeping in mind a clear “build to sell” focus, these companies are fast-growing but attractive to potential acquirers within their respective market. Currently, the VC industry as a whole is in a difficult position, and the traditional VC model as well as early-stage companies will suffer if deal and exit volume continues to decline. The venture development model is poised to help early-stage companies, all while reducing risk and shareholder dilution for investors. Without shifting focus, the venture capital industry will continue to underperform.